Thomas Schelling was recognized by the Nobel Prize committee as a pioneer in the application of game theory and rational choice analysis to problems of politics and international relations. However, although he makes frequent references in his writings to this approach, his main explorations and insights depend upon and require acknowledgment of its limitations. One of his principal concerns was how a country could engage in successful deterrence. If the behavioral assumptions that commonly underpin game theory are taken seriously and applied consistently, however, nuclear adversaries are almost certain to engage in devastating conflict, as John von Neumann forcefully asserted. 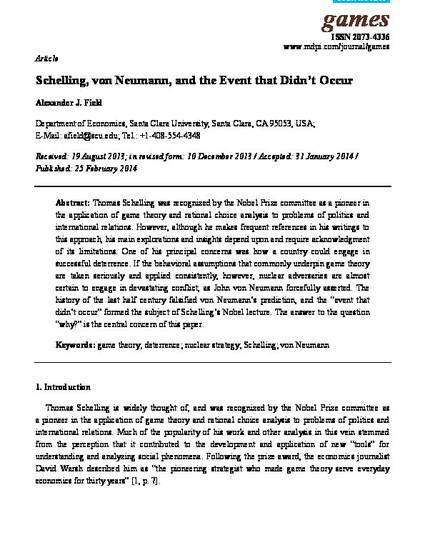 The history of the last half century falsified von Neumann’s prediction, and the “event that didn’t occur” formed the subject of Schelling’s Nobel lecture. The answer to the question “why?” is the central concern of this paper. Field, A. J. (2014). Schelling, von Neumann, and the Event that Didn’t Occur. Games, 5(1), 53–89. http://www.mdpi.com/2073-4336/5/1/53.